Russian Helicopters (Booth 4030) has come to LABACE to promote its extensive portfolio of civil rotorcraft, which it claims are well suited to a variety of private, corporate and industrial uses. This year, one of the group’s key subsidiaries, Rostvertol, is celebrating its 75th anniversary–emphasizing Russia’s strong pedigree in helicopter production. According to the company, the fleet of Russian-built helicopters in Latin America has grown by 6 percent over the past three years, rising from 385 aircraft at the start of 2011 to 409 at the beginning of this year (including military types). So far, the most popular models in this part of the world have been from the Mi-8/17 family. 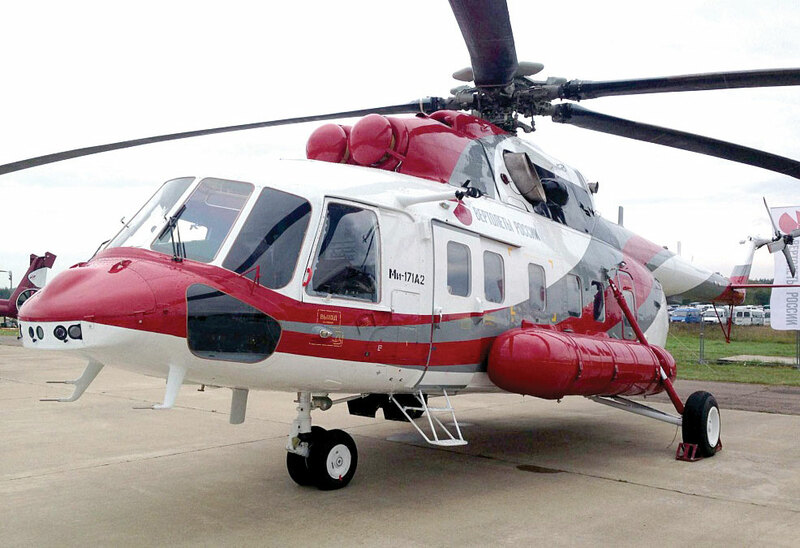 The latest example of this is the Mi-171A2, which features upgraded engines, a new main rotor system and advanced avionics, all of which are intended to make it a more cost-efficient proposition to a variety of civil operators. One of most versatile models offered by Russian Helicopters is the Ka-32A11BC twin, which is well suited to operating in urban areas like Saõ Paulo, but also can be employed for missions such as fire fighting and rescue work. The type is already operating in Brazil, as well as numerous other countries around the world. Now in development at Russian Helicopters is the latest version of the multirole Mi-38 helicopter, which features a spacious passenger cabin and low noise and vibration levels. In its cargo configuration, the aircraft can carry up to six metric tons (13,228 pounds) internally and up to seven metric tons (15,432 pounds) with an external sling. The new model is due to complete certification in 2015. The twin is powered by a pair of Klimov TV7-117V engines and promises a cruise speed of up to 159 knots (295 km/h) and range of up to 648 nautical miles (1,200 km). In the light rotorcraft segment, Russian Helicopters offers the Ka-226T. The type is well proven in extreme temperatures and also has experience operating from terrain as high as 24,600 feet (7,500 meters) and carrying freight weighing 441 pounds (200 kg) at altitudes. There are also plans to power the new Kamov Ka-226 helicopter with the Arrius 2G1 turboshaft produced by France’s Turbomeca. The French group’s Ardiden 3G has been selected for the new Ka-62. According to Russian Helicopters general manager Alexander Mikheyev, the group now holds a 14-percent share of the world market for rotorcraft. It intends to increase this to 18 to 20 percent over the next three years.